Click image for full-size view or to print. Utilizing plasticulture equipment can help reduce soil compaction and soil-borne pathogens, increase water and fertilizer efficiency and extend the growing season. Additionally, crops are better protected from soil and water splash, resulting in cleaner harvests. Alternatives to plastic mulch film include biodegradable mulch, landscape fabric, paper, and burlap, which can all be utilized by the mulch layer. The N.C. 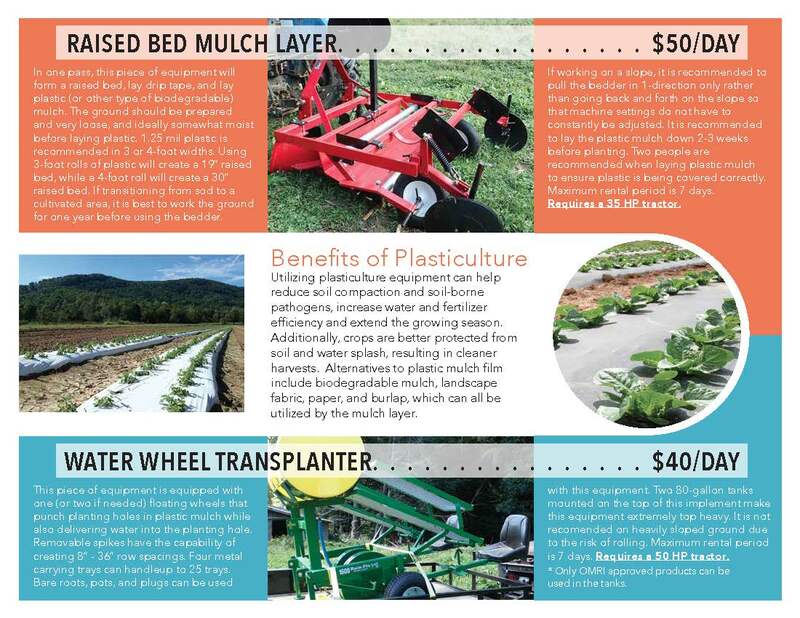 Cooperative Extension of Buncombe County Small Farms Program has two pieces of plasticulture equipment that farmers in the WNC region may rent for their farms. A water wheel transplanter and a raised bed mulch layer are both available to rent for a nominal fee. Please see additional details in the image above and details below. • Farmers in Buncombe, Haywood, and Henderson counties are eligible to rent the equipment. • Users are responsible for transporting the equipment and hauling trailer to and from the equipment storage location in Candler, NC. • Users must sign a rental contract, and provide proof of insurance prior to renting. • Equipment must be thoroughly cleaned and all soil debris removed before returning the equipment to the storage location. Cleaning fees will be charged if necessary. • Farmers are responsible for any damage they cause to the equipment. • Users will be billed for the number of days the equipment is used and must remit payment within 30 days. Late fees will be charged if equipment is returned after the contract date. To schedule equipment rentals, or if you have additional questions, please contact the Plasticulture Equipment Project Manager, Meghan Baker at meghan_baker@ncsu.edu or 828/255-5522. The Buncombe County Plasticulture equipment, which includes a Raised Bed Mulch Layer and a Water Wheel Transplanter, was purchased with grant funds made available by the TVA Ag and Forestry Fund. • Should You Buy or Rent?